Are these the best travel quotes of all time? 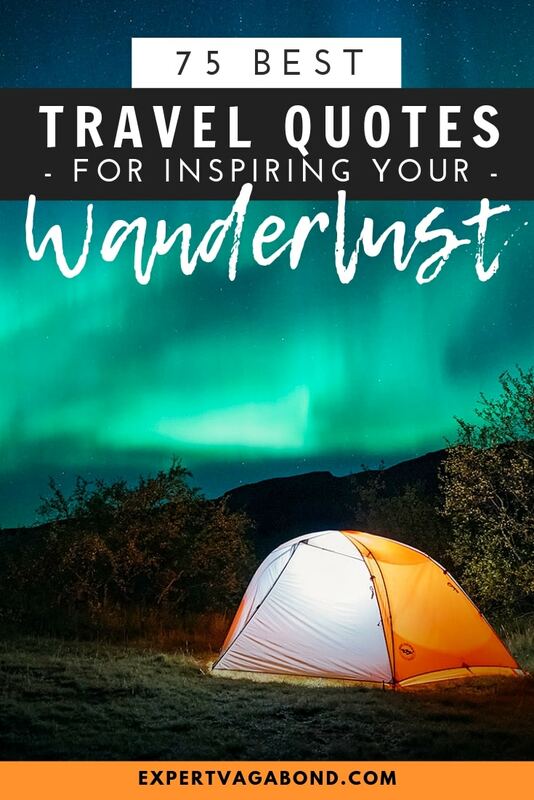 Feed your wanderlust with these inspirational travel quotes from famous travelers along with beautiful images you can share. Here are my favorite travel quotes of all time, paired with some photos from my personal adventures around the world. I often share them on Instagram, Facebook, and Pinterest. You have permission to share these quote images on your own accounts too, all I ask in exchange is to please credit me when possible. Thanks! I hope they inspire you to pack up everything and head out into the unknown, to explore the farthest reaches of our planet (and your soul) — to see the world for what it really is. 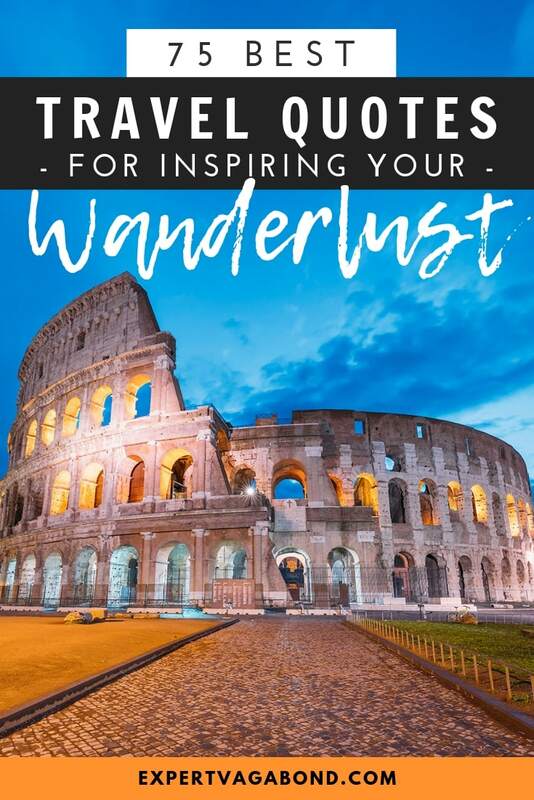 Browse these fun quotes when you need wanderlust motivation — to make travel a priority in your life! Ready To Travel The World? Traveling is one of the best ways to open your mind and heart to the world. As a result, I’ve experienced the full range of emotions during my travels. Although this has sometimes meant having my lifestyle and point of view challenged, I wouldn’t give up a single second of it because it helped shape me into the person I am today. Travel can change your perspective. Like a less-intense version of an astronaut’s overview effect. 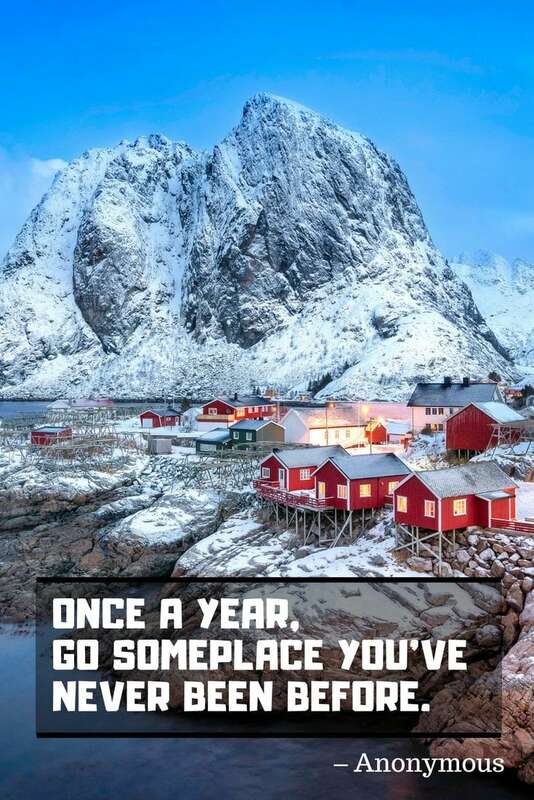 Many of these travel quotes have inspired me to keep exploring. 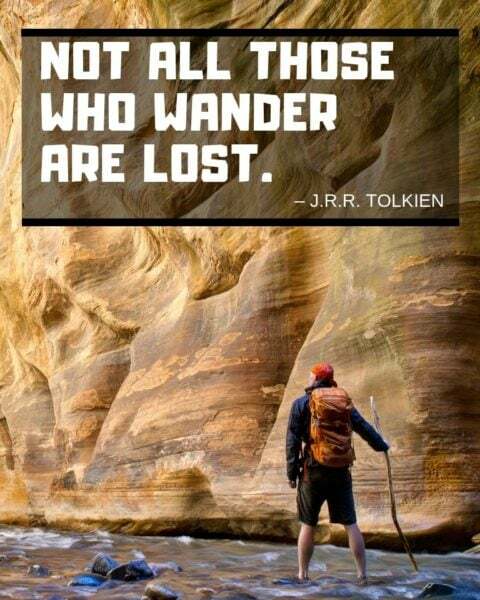 If you’re looking for inspiration to fuel your wanderlust, you’re certain to find the perfect quotation below! 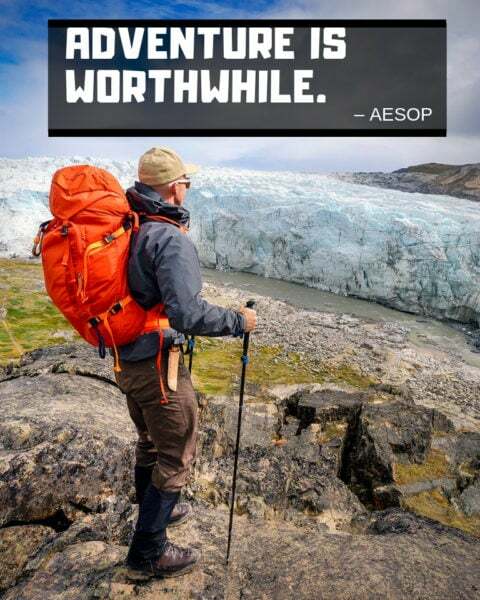 Adventure is always worth it! It doesn’t get more simplistic than Aesop’s take on traveling, the ancient Greek fabulist and storyteller. 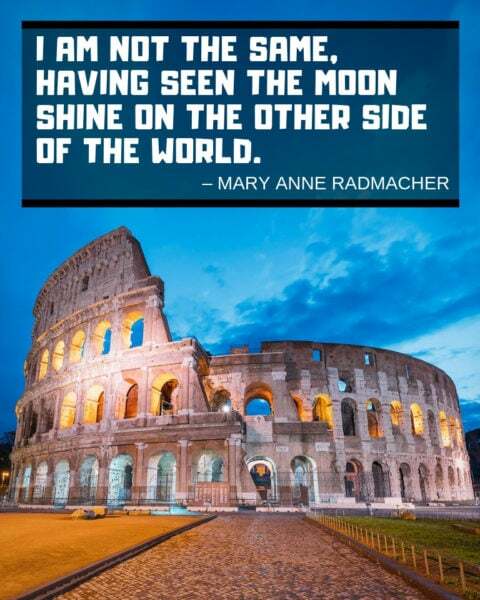 But that’s exactly why this classic travel quote continues to inspire me. Adventure can remind you about what’s important in life. The late, great Anthony Bourdain really hit the nail on the head here. Many think of traveling as a way to relax, and it absolutely can be. However, I’ve always found that traveling helps you learn about the good and bad parts of the world. I’ve seen awe-inspiring things that I thought I’d never be able to explain to another person. Somehow, these experiences have helped me become a better storyteller. 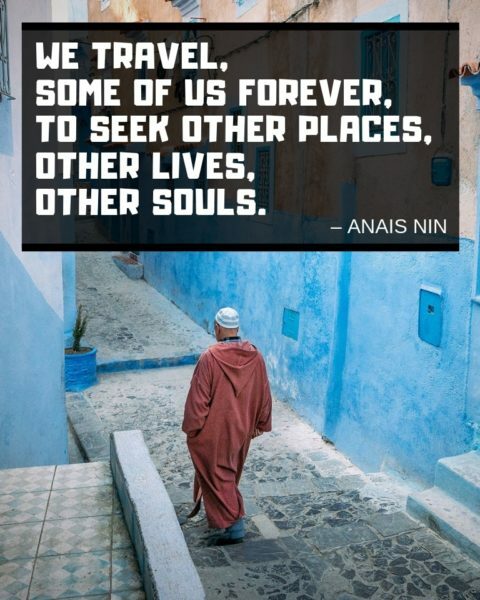 Anais Nin’s quote about traveling on a constant search for things that will make us feel whole sums up the desire to keep learning through experiences. I couldn’t agree more! 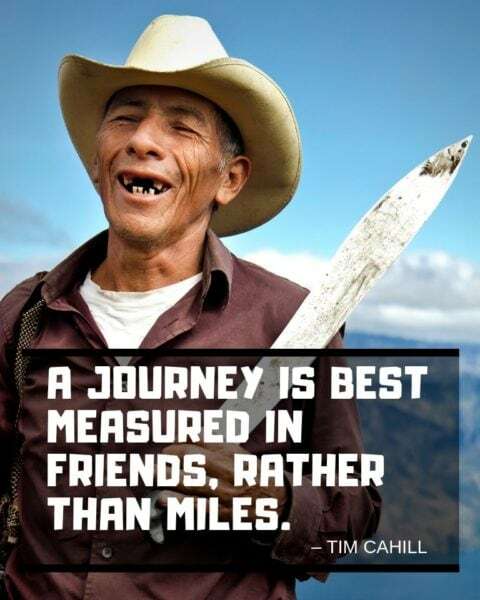 I’ve made many friends around the world, and it’s the time I’ve spent with them that has made my travels so fulfilling. People are always more memorable than checking off a bucket list. 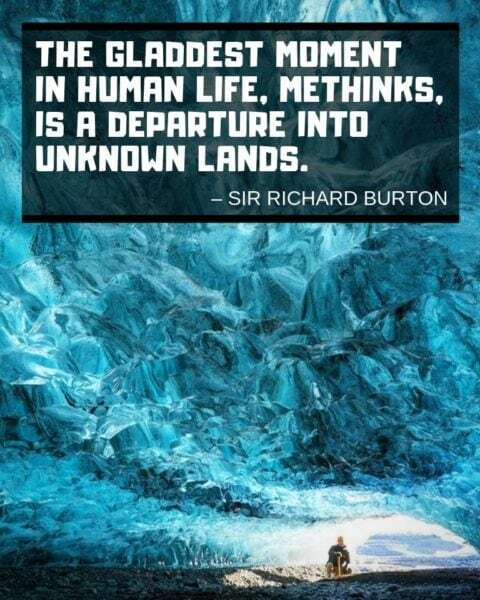 Sir Richard Burton eloquently captured the spirit of wandering off into the unknown with this travel quote. The moment of anticipation is often sweeter than the final result. Have you ever looked at your hometown through the eyes of a tourist? I understand how easy it is to get jaded, but the truth is that every single place in the world has something of interest to show you. I often gaze at the stars when I’m visiting a new destination or on a road trip. It’s amazing to consider how places are the same, yet so very different. Flaubert continued Radmacher’s wise observation in this insightful trip quote. I definitely used to think that my life, and my country, played a bigger role in the world until I strapped on my backpack and began traveling. We travel so life does not escape us. I feel a heavy weight on my heart when I don’t travel for an extended amount of time. As soon as I set off for someplace new, the burden of stagnation falls away and I feel renewed. I’ve heeded Henry David Thoreau’s advice on many occasions. 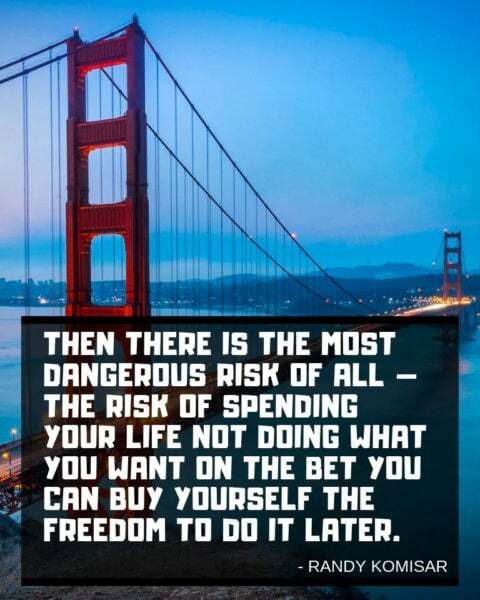 In fact, of all the quotes about traveling I’ve collected here, this one has been the most influential. 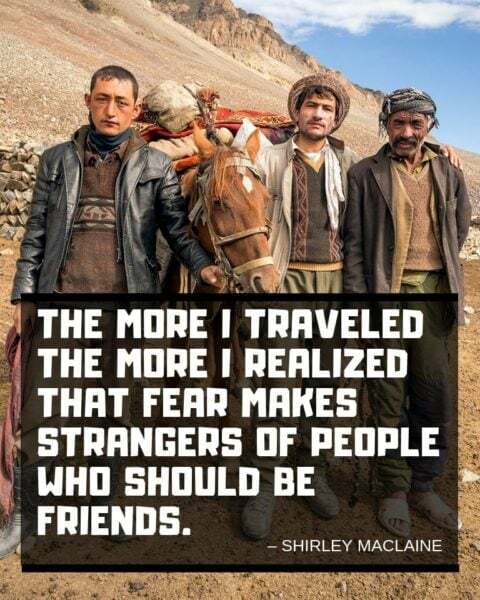 Don’t be afraid to travel alone. A change of view always helps give me a new perspective on life. Traveling allows waking up to a different view on a regular basis. 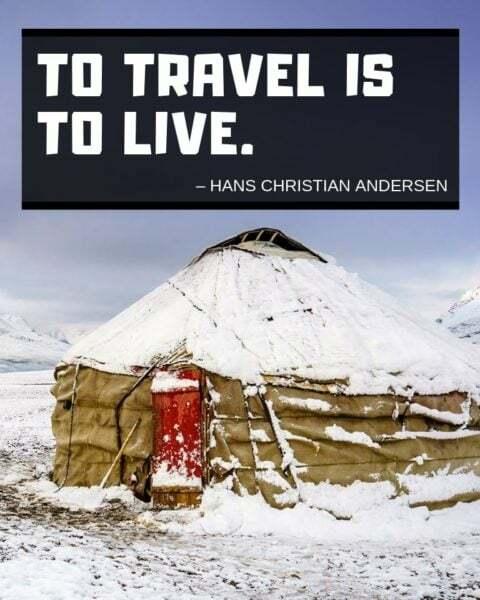 The perfect traveling quote. 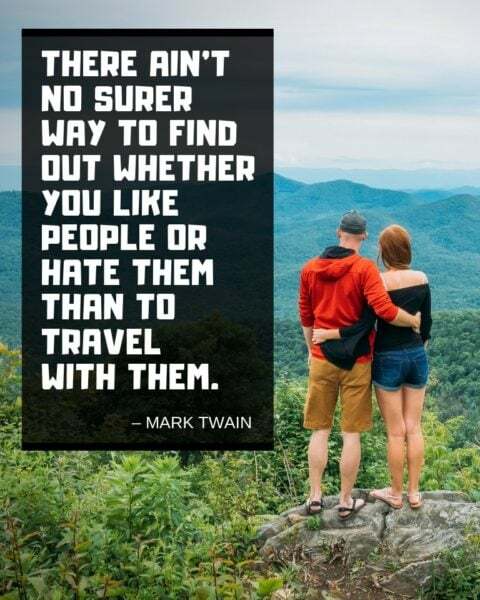 I wish the entire world could understand Mark Twain’s insight into traveling. We all have preconceived notions, but traveling has shown me that many are usually false. I used to be afraid to reach beyond my comfort zone. 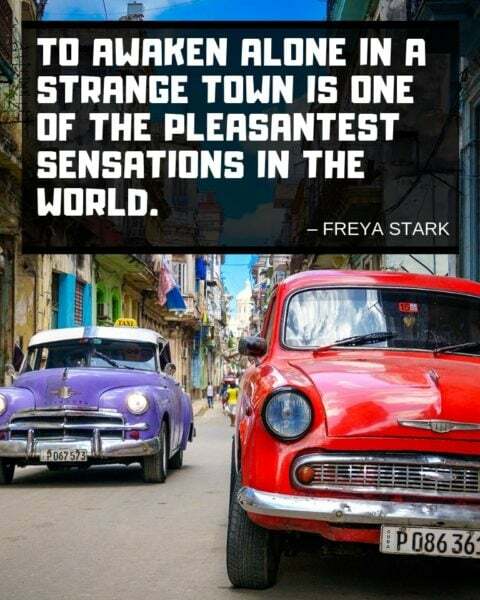 This is a great travel quote about throwing off the so-called safety net of your comfortable surroundings to discover new parts of the world (and yourself). There’s so much wisdom in Samuel Johnson’s quote on travel. Take a second to visualize a place you’ve never been. If you make that your next vacation spot, I bet you’ll find out that it’s completely different from your internal image. We may feel safe in our little bubble, but it’s also boring. 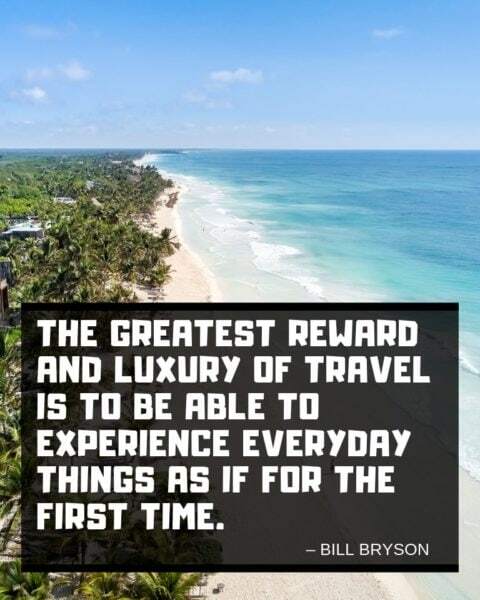 That’s the primary reason I started traveling several years ago, and I’ve fallen in love with the thrill of discovery. 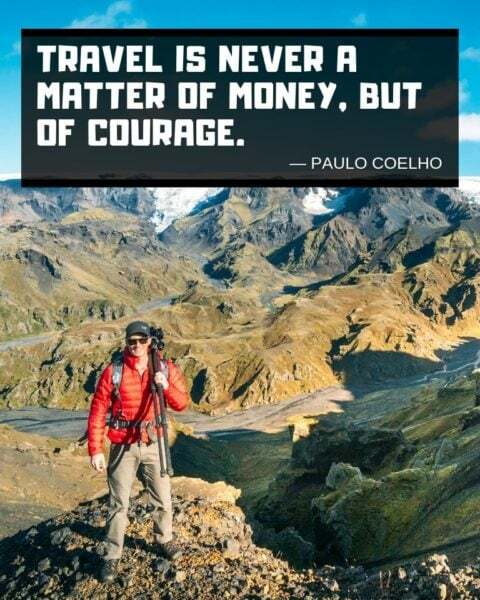 It doesn’t get any more real than this short travel quote. When I travel, I’m able to give my mind something new and exciting to focus on. Studies say that we need to keep learning in order for our minds to thrive. 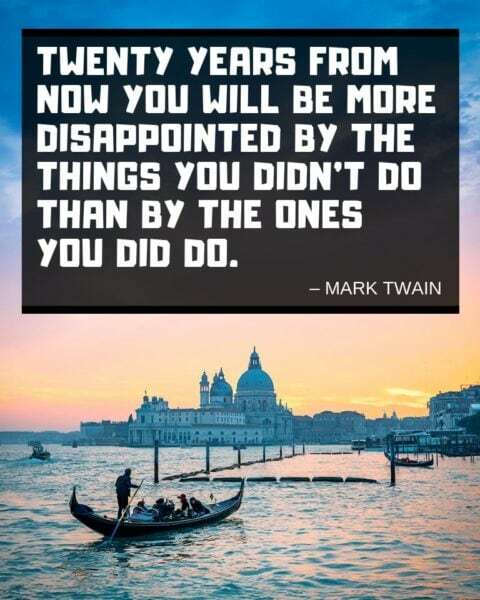 Mark Twain proved once again to be an extremely wise man with this travel quote about the power of regret. I cannot imagine reaching the end of my life with a huge bucket list of things that were never crossed off. 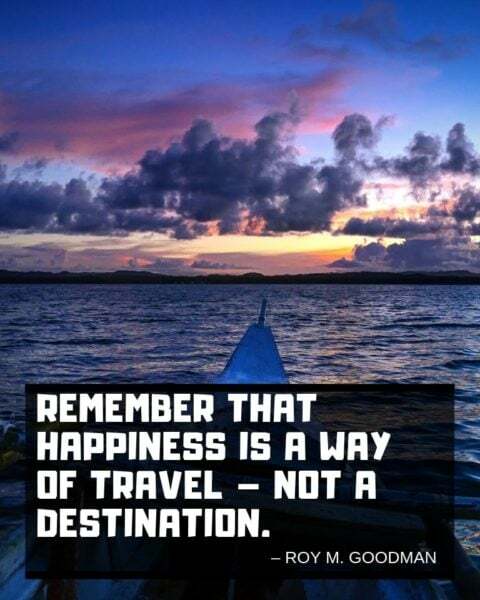 This simple travel quote says it all. My mind craves new experiences, and I quite simply cannot get them from my hometown anymore. By going somewhere new at least once a year, I continue to grow in numerous ways. Money makes traveling a possibility, but it doesn’t enrich you like sharing experiences with new cultures. 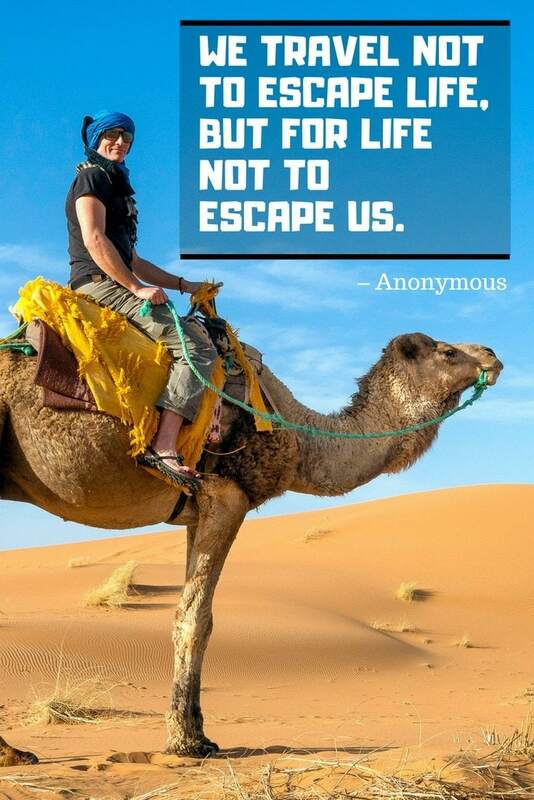 I’m not sure who coined this inspirational travel quote, but they hit the nail on the head! In perhaps the timeliest travel quote of all, Huxley reminds us that countries themselves aren’t bad, nor are their residents. Governments can be corrupt, but the spirit of the people always lives on. Nothing can replace the thrill of travel for me. I’d rather see things in the real world than spend my time imagining them. None of the entertainment devices that humans have invented can come close to the joy I experience exploring the world. I’ve been at my best, and at my absolute worst while traveling. Emotions are bigger during these trips because there’s so much new information to process. 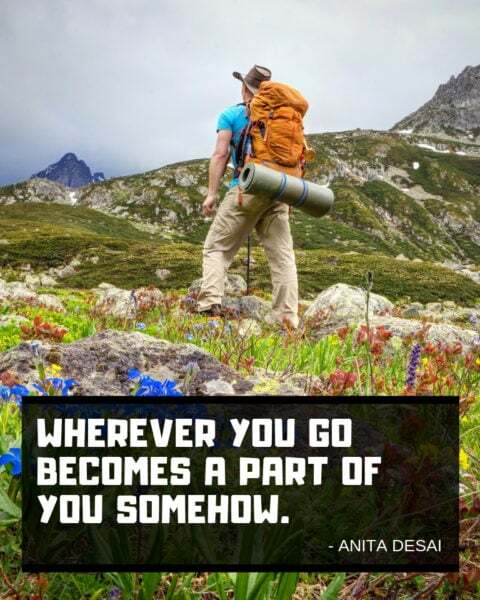 Peter’s travel quote reveals a truth that many travelers can relate to. 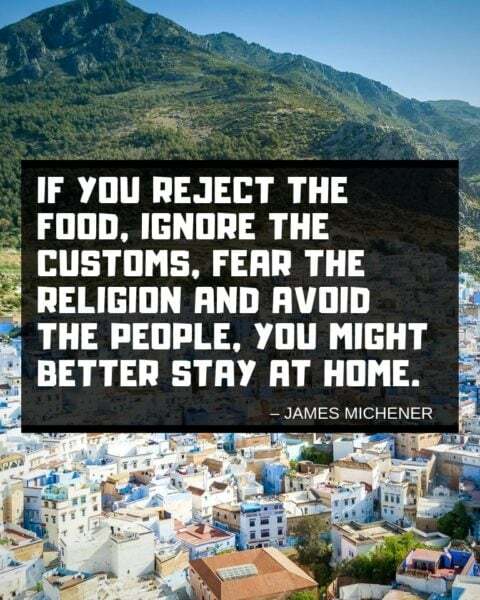 If you reject the food & ignore the customs.. 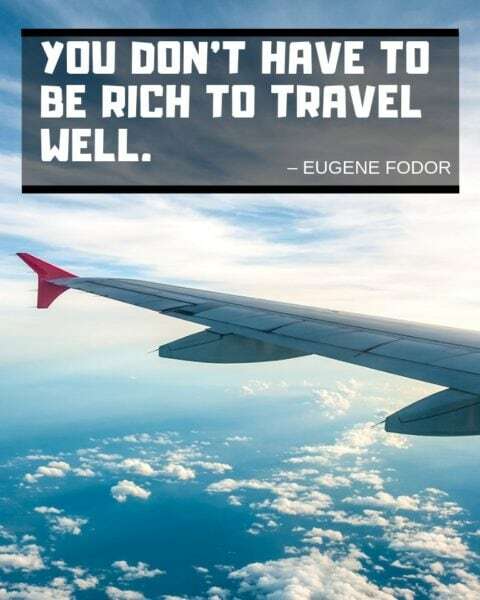 Creator of the famous Fodor Guides Eugene Fodor’s quote helps highlight that people of almost any budget can travel. For example, a few years ago I hitchhiked across the United States for 5 weeks, and it was one of my best travel experiences. I completely agree with Michener. There’s really no point in traveling to a new country if you’re only interested in staying inside the walls of a resort. I believe that the point of traveling is to learn about new cultures and customs and truly open our minds. Going on a trip may start with a lot planning, but the truth is that once you arrive somewhere new, the area instantly begins to change you. Traveling can truly be transformative if you allow the trip to take hold of you. If you think your country does everything the right way and is revered by other nations, you’ll definitely have those notions put to the test when you enter another country. I’ve learned so much about the way my nation is viewed on the international stage. 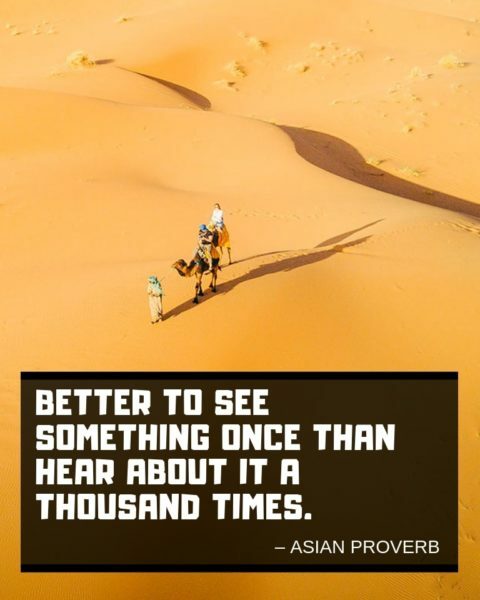 This is the perfect travel quote for Instagram or Pinterest. Have you ever felt the rain on your skin in multiple countries? I have, and I’m here to tell you that it’s always a thrilling sensation each time it happens somewhere new. By traveling, I’ve learned to appreciate things that I would normally ignore. Just like everyone else, I spend some of my days sitting on a couch watching television. Of course, these aren’t the moments that define me, nor are they what I think of when wandering through my favorite memories. It’s the adventurous side of life that makes living truly worthwhile to me. 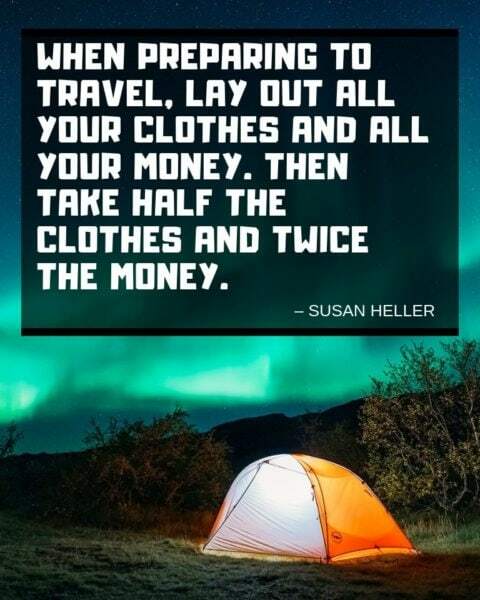 Yes, travel does require some money. However, you’ll also need to gather enough courage to temporarily cast off everything about your daily life that makes it so comfortable — and boring. I used to obsess over every single little thing that could go wrong during a trip. This caused me to overly plan everything. Little things can go wrong anywhere, so they’re not worth worrying about. 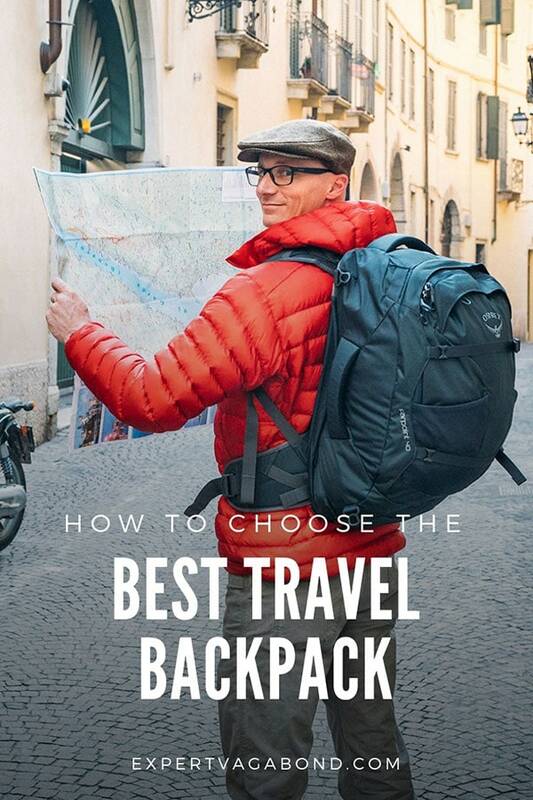 This became one of my travel mottoes after an unfortunate experience trying to schlep a massive backpack from the airport to a hotel via public transportation. 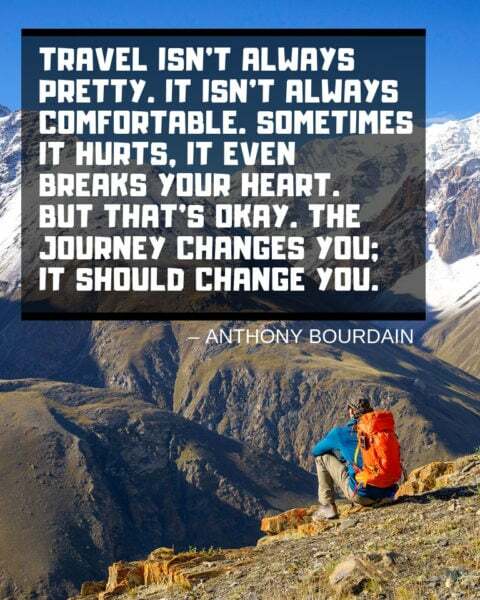 I know exactly what ol’ Antoine was talking about in this travel quote! If we’re being honest with ourselves, the routines of daily life are monotonous. For me, all it takes is a trip to a new city or country to reignite my sense of adventure. Tolkien’s wisdom really shines through in this quote. I have applied it to several of my trips by allowing myself to simply wander through a new land as opposed to plotting everything out first. This quote is as relevant today as it was when it was first uttered. People have an unfortunate tendency to claim others as their enemy without even getting to know them first. This is an issue that’s propagated by fear of the unknown, and it has led to a lot of lost opportunities throughout history. Staying in one place for too long definitely makes my wanderlust start itching for a new adventure. Routine has its place, but too much of it makes me feel stagnant. I love shaking up my daily life by visiting a new place and immersing myself inside a different culture. Everything I’ve learned during my travels has forever expanded and changed my mind. 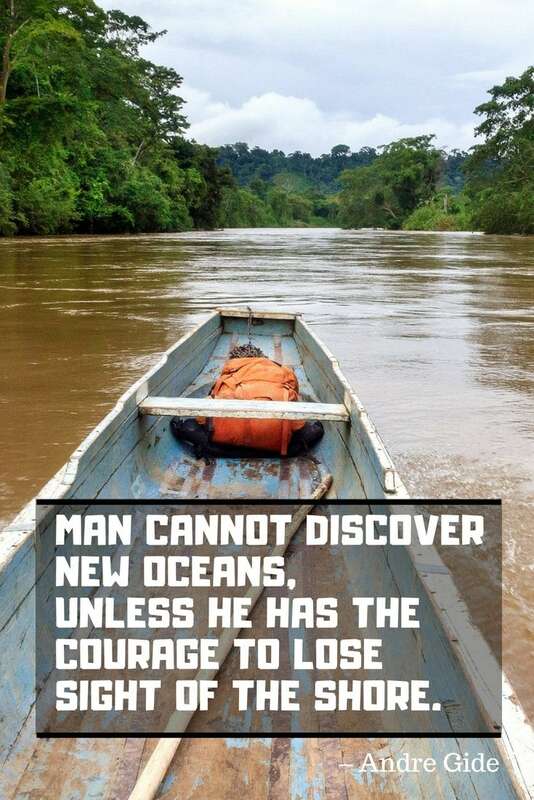 This travel quote shows Holmes clearly grew in a similar way by visiting new lands. 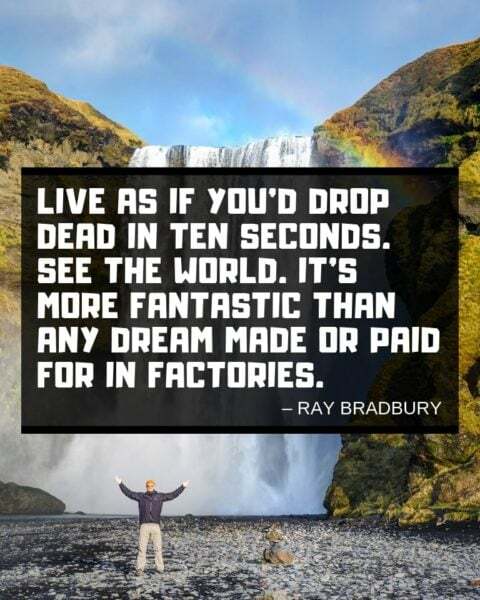 Many chase the elusive dream of happiness when they should be embracing it inside of each little moment, as Roy alludes to in this inspiring quote. I learned long ago that happiness is found in the details. What is your comfort zone? If I’d never learned to stretch mine, I’d still be sitting on the same couch after work every single day for the rest of my life. Instead, I challenged myself to tackle new challenges and to see areas of the world that had intimidated me. One of my favorite travel memories involves sitting on a sidewalk in Nicaragua eating some chicken & rice. I watched local people walk by for at least 30 minutes, going about their daily routines. This simple experience still defines Nicaragua for me in a way that visiting a famous tourist attraction never could. I frequently remind myself of this quote about traveling from Henry Miller. After all, simply checking off travel locations means nothing if you don’t allow each trip to change you in some way. I love to soak up a new culture and learn more about the locals’ point of view. Every place on the planet has great potential to help us learn and grow. That’s the primary reason that there’s nowhere in the world I wouldn’t go if I had safe passage. Right now, there are some cities and countries that aren’t very welcoming, but I’d still love to see them someday. You cannot possibly hope to learn the true nature of the world by doing nothing more than reading about it. As valuable as reading is, it always takes a backseat to discovering the world for yourself. This is one of the classic travel quotes that everyone would be well-advised to remember. It breaks my heart to see historic areas filled with trash by careless travelers. We have a responsibility to preserve things as much as possible. I took Frost’s words at face value in my teen years, but as an adult, I realize there’s much more to his sentiment. Seeing and doing the same things as everyone else can make it difficult to discover your own true identity. The start of each new trip is an exciting time that’s characterized by a mixture of wonder and fear. You have no idea if the trip will go as planned, but the unknown is what makes everything so exciting. 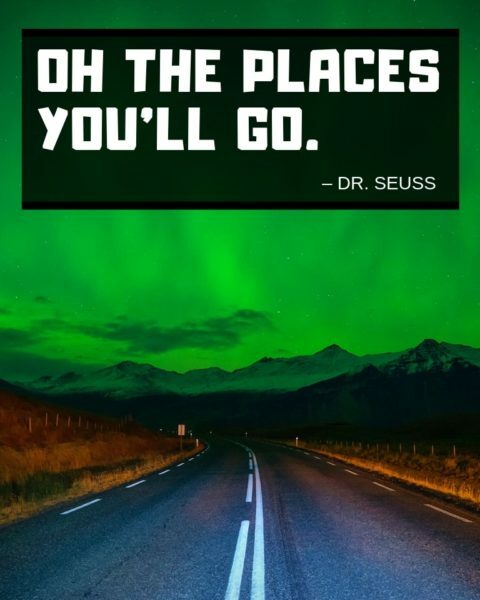 Dr. Seuss serves as a reminder that we can go anywhere if we stop putting restrictions on ourselves. The world is waiting; we just have to have the courage to answer the call. Doing this, again and again, has given my life meaning. Much like the hidden parts of our souls, we cannot hope to find something completely original and unspoiled without wandering off the map. I give myself the freedom to explore anything that catches my attention. Yup. 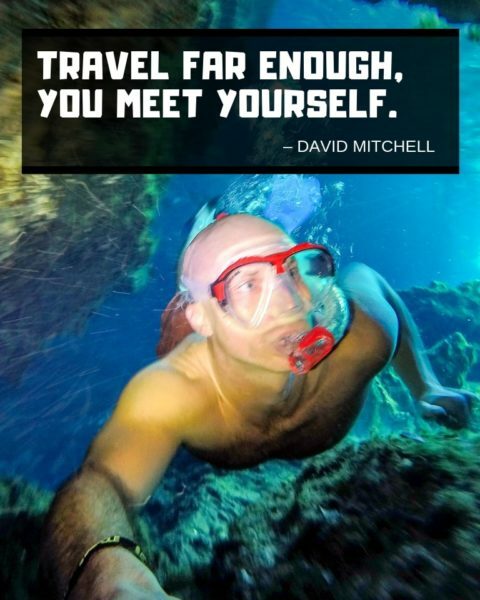 I’m Matthew Karsten, and I totally just snuck in one of my own travel quotes. Haha! But I really mean this too. When I first quit my unfulfilling day job to go backpacking around the world, I didn’t know what I was doing, or where it would all take me. But traveling taught me a lot about life, as well as myself. Stevenson was much more than just a revered novelist; he was also a travel writer. This particular inspiring quote has always spoken to me. The urge to go somewhere new, no matter where it is, frequently grabs me. There is nothing more exciting than turning a corner while traveling and finding something riveting. I remember this happening when I stumbled onto a work of art by street artist Banksy. I don’t even remember my original destination, but I do remember the way I felt looking at Banksy’s art! This is, by far, my favorite Asian proverb, and it’s truly one of the world’s most accurate travel quotes. I am always in awe when I find myself standing in front of an iconic landmark. Sometimes, they’re less impressive than the stories I’ve heard, but even that’s a worthwhile experience. 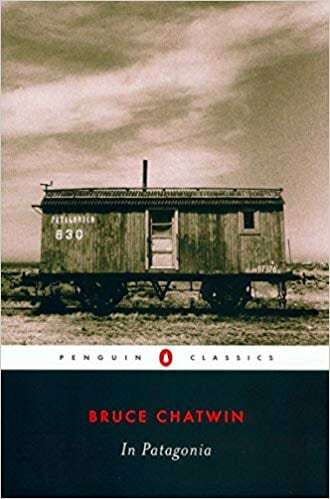 Is there anyone more uniquely qualified to provide insightful quotes about traveling than the author of “On the Road?” Traveling doesn’t always go as smoothly as you’d expect. Despite this, I’ve discovered many times that the trip itself is every bit as exciting as the destination. Pavese’s books often spoke about loneliness and the inability to connect to others in a meaningful way. Although his commentary on traveling does contain some truth, I’ve always taken it with a grain of salt. Yes, traveling can be brutal at times, but I believe it’s also one of the most freeing experiences a person can have. Many people say inspiring things, but Komisar has lived them as a successful venture capitalist. Don’t fall into the trap of believing there will eventually be a perfect time to follow your dreams. Through traveling, I’ve learned the only perfect time is now. 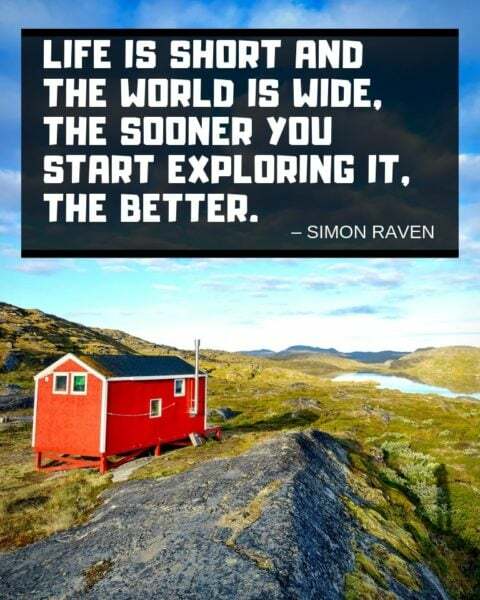 Controversial author Simon Raven said a lot of odd things in his time, but his travel quotes were typically spot on. After all, the only way to see the entire world is to start taking travel-sized bites out it as early as possible. Eliot’s poetry inspired countless writers, but I’ve always been the most taken by this simplistic quote. When I first started traveling, I placed way too much focus on getting to my destination. By learning to let that go, I’ve developed some of my fondest travel memories. If you want to read humorous but insightful books about traveling, you should definitely check out Bill Bryson. He’s absolutely right about not taking things for granted on the road. I grew up reading Anderson’s fairy tales but didn’t know about his travel writing until later. Now, I know that his many quotes about traveling truly captured the essence of why it’s so important to explore new areas. Heat-Moon was so dedicated to writing unique travel books that he journeyed across the U.S. in a 1975 Econoline van. I also love the idea of getting a fresh start in every new town. Fuller broke new ground with his literary skills, which allowed him to earn a living long before being an author was a viable full-time career for writers. Some say that everyone is changed for the better by traveling, but Fuller warned us that this wasn’t the case. American treasure Mark Twain wasn’t one to mince words, but his humor made even the bitterest truths easier to swallow. Unfortunately, I found out the wisdom behind his words the hard way through experience. Stevens had a love for the simple things in life, as evidenced by one of his titles: “The Emperor of Ice-Cream.” He’s also right; the entire world contains beauty. That’s why I long to travel to every country on earth. It’s unsurprising that someone who learned directly from Gandhi would have such an inspiring way of looking at the world. Open your eyes to the beauty of a sunrise or waves rolling into the shore. No matter how many times you’ve seen them, they’re still full of beauty. Melody Truong’s words resonate with me because they’re so full of truth. The feeling of loving unexplored parts of the world is exactly what pushes me to keep traveling. Take half the clothes and twice the money. Heller’s widely quoted travel adage has influenced the way I travel. I used to pack way more than I needed, and this hindered my travels. Cutting your luggage down and packing more money always makes things easier. David Mitchell’s best-selling novels typically involve traveling, as evidenced by this quote from “Cloud Atlas.” It’s difficult to get to know yourself when you’re stuck in the rut of normality. I always have the best self-awareness breakthroughs after a period of travel and inner reflection. People have turned to Covey for business advice for years, but I’ve found the most value in this one simple quote. I used to meticulously plan each trip down to the minute. Being born in Yosemite National Park enabled the travel bug to bite Papritz at birth. His thought-provoking spin on the purpose of travel has greatly influenced me. I may never see it all, but that doesn’t mean I shouldn’t try. Indian novelist Anita Desai nails this one with her inspiring quote about traveling. We’re all shaped by each of our experiences. I love it that every new adventure helps shape me for the better. Bradbury’s books often transport readers to another time or place. We cannot travel to other time periods in the real world, but we can take in the architecture of the past. Author Mandy Hale embodies her viewpoint as the “single girl with a story to tell.” I try to remind myself of this quote whenever life seems to be spinning out of control. Confucius was an early proponent of social equality who urged people to live a life of morality and sincerity. 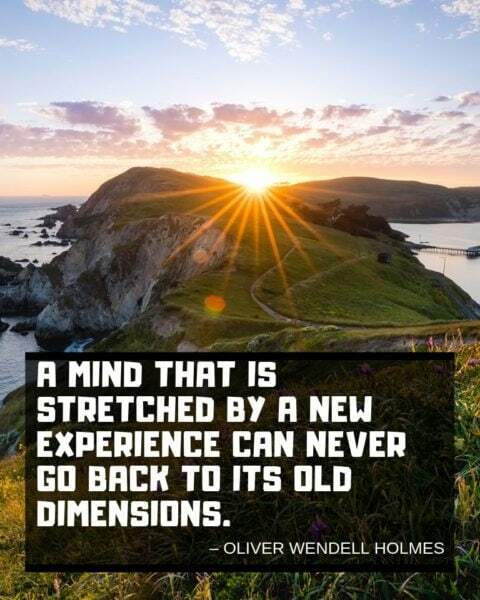 I’ve interpreted this quote to mean that it’s important to be fully committed to each new experience. Congratulations on reading down this far! 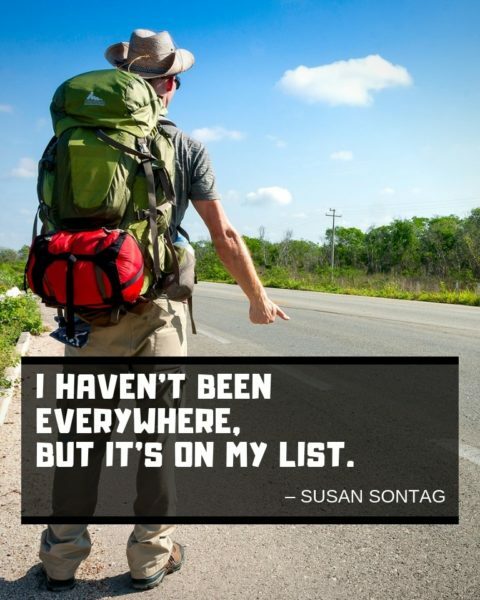 I know that was quite a list of inspiring travel quotes from famous writers. But if you’re still sick with wanderlust, and ready to travel more, you’re in luck. The travel blog you’re reading right now is how I make a living while traveling. Interested in doing the same? If you enjoy writing & photography like I do, check out my free guide to starting your own travel blog. 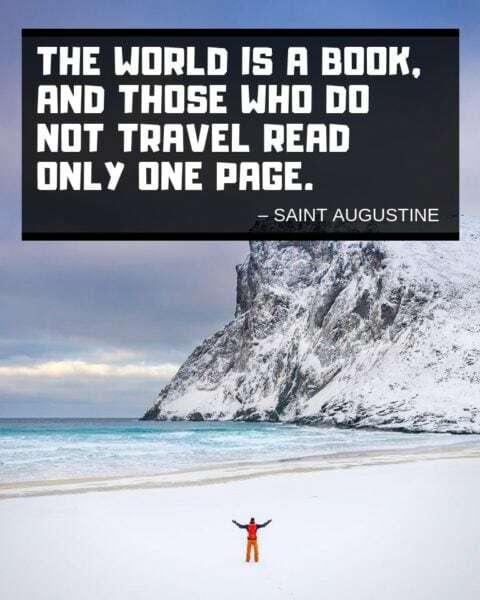 Have any cool travel quotes I missed? Which is your favorite? Drop me a message in the comments below! I’m retired now and have been traveling over 40 years to see what Mother Nature has made. It is absolutely awesome!!! Been following you around the world and you definitely keep expanding my Bucket List. This quote is my favourite – “Traveling tends to magnify all human emotions”. 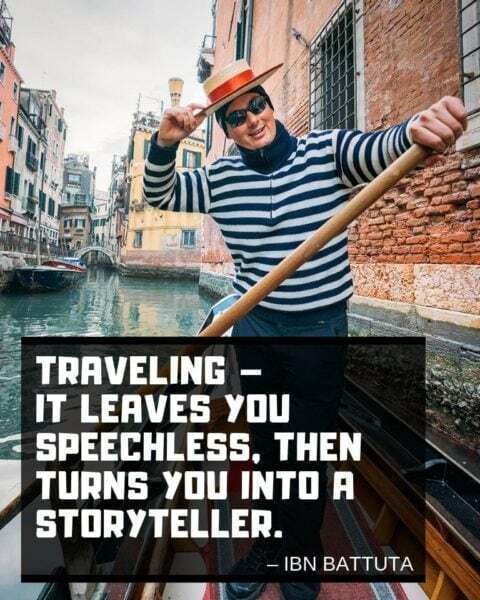 “Travelling Leaves you speechless turns you into a storyteller” is my favorite travel quote from this list. I loved your blog posts which really mean valuable info on travel matt. Great images with the quotes too! Hey Mark! Glad you’re enjoying them. Thanks for following along! it was wonderful to read the quotes , i have a passion of exploring the new places, meeting with stranger people, enjoying the cultural and historical heritage. Thanks for sharing such a valuable stuff. May God bless you. Glad you enjoyed them so much! I always come back to read them every once in a while before my next trip. These writers have much knowledge to share! I love all the quotes. Too good. “traveling it leaves you speechless, then turns you into a storyteller”. Yes, the more we traveled, the more we appreciate nature, people and the universe. We become more grateful and appreciate life. That’s how I feel. Completely agree with you Angel. I know it’s cliche, but travel really does change your perspective and open your eyes (and mind) to what else is going on out there in our big world. 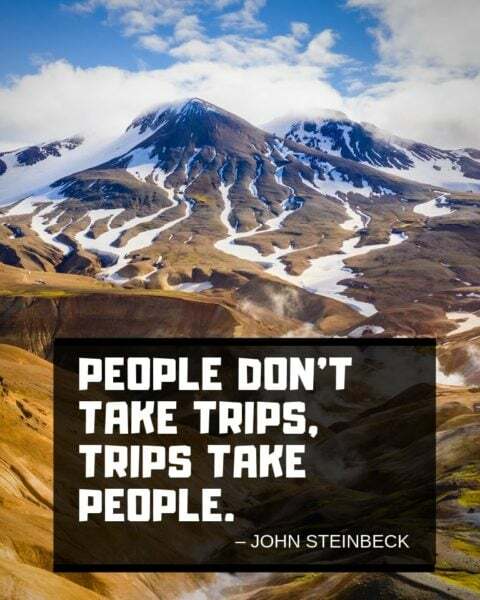 This is one of my favorite traveling quotes too. Loved his books! Epic list! 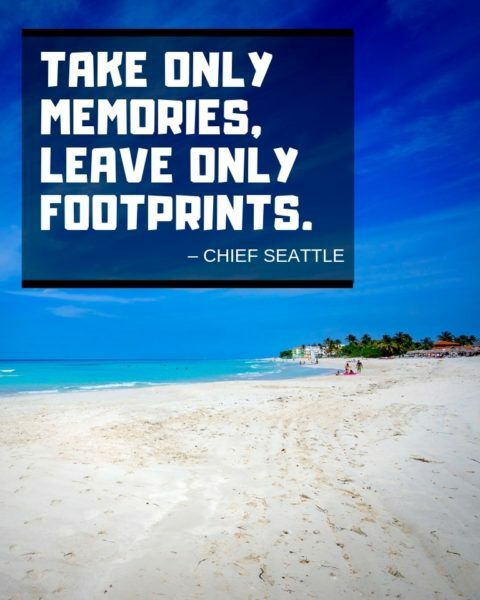 We love reading travel quotes – always a great source of inspiration! 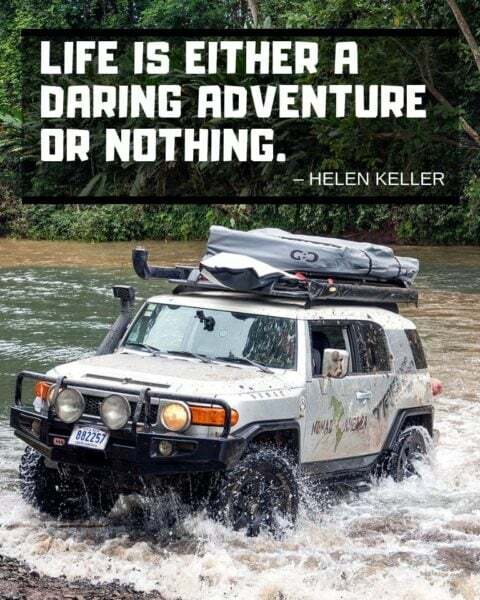 Amazing Quotes especially “Life is either a daring adventure or nothing.” – Helen Keller. Great post wonderful photos. Love from India. I really liked your blog about travelling. 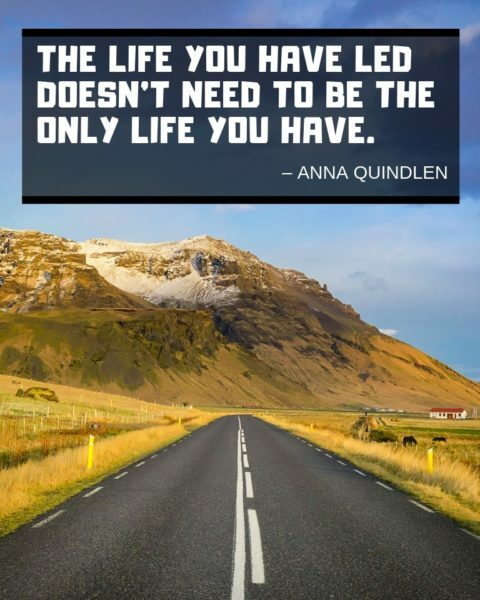 Your quotes are very inspiring for those who love to travel. 1. “You might not have been my first love but you were the love that made all the other love irrelevant”. 2. “How you love yourself is how you teach others to love you”. 3. “I din’t leave because I stopped loving you I left because the longer I stayed the less i loved myself”. Quotes to motivate you by Rupi Kaur. ” I didn’t leave because I stopped loving you I left because the longer I stayed the less I loved myself”. I really loved this. Nice ones Ananthi! But who was the author? This is so awesome! Great list, Matt I love coming back to these for a bit of inspiration. “What does it matter where or how we die, As long as we have our health to see it all” – Sestina of the Tramp-Royal. 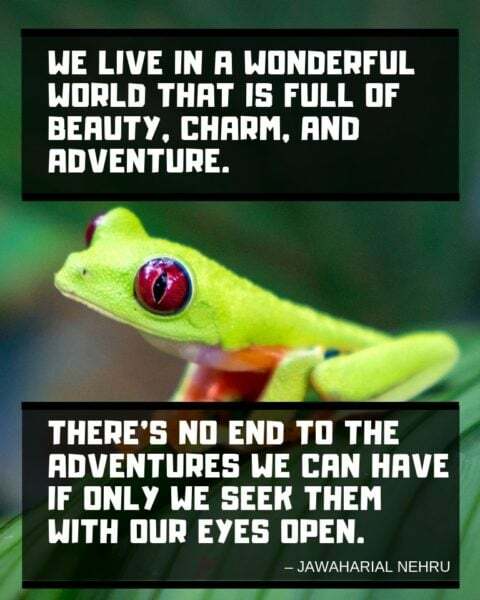 That’s a great travel and adventure quote! I’ll have to remember that one. 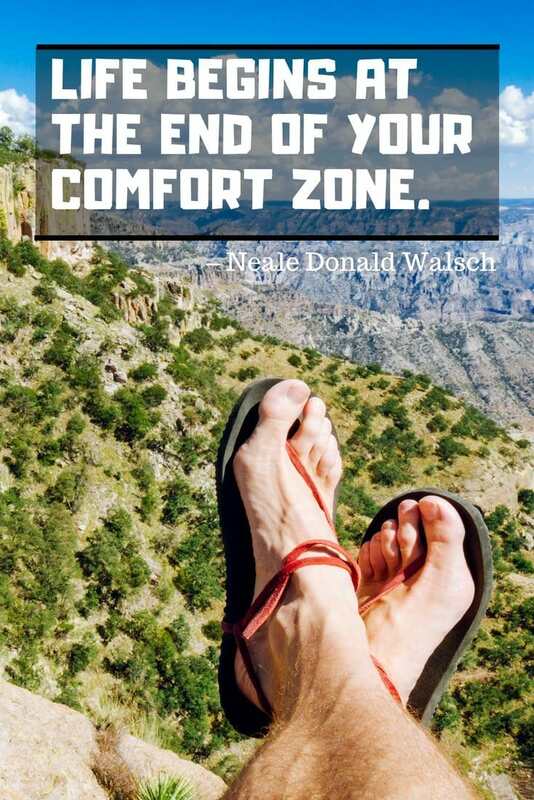 Awesome post but I fell in love with: “Life begins at the end of your comfort zone.” – Neale Donald Walsch. I strongly believe when you travel you learn more. I completely agree! Great quote of his. You need to challenge yourself in life to make it interesting, and travel is a great way to do that. This is just an amazing list! 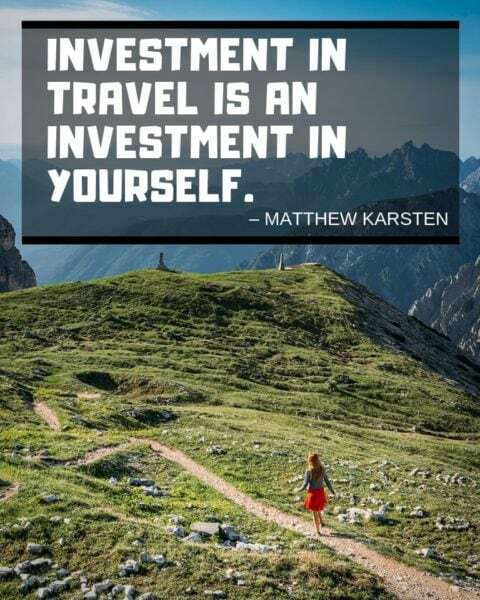 Your own quote “Investment in travel is an investment in yourself.” ~ Matthew Karsten is also so true, I will quote you for sure! Love that one! I’ll have to add it to my list here. A ship is safe in the harbour, but that’s not what ships are built fore. I love to travel! It brings me positive outlook in life and it helps me relax! I normally do this once a year and then I am taking up lectures in almentor. This help me to become happy in life. I saw this among the quotes in Wenceslas Square Prague, while on my travels. It’s important to me because I can make excuses when it comes to getting out of my comfort zone even though I know that some of the most memorable moments of my life have been when I done just that.